When an elderly four-legged companion passes away, people often turn to Petfinder to find solace by adopting a new furry friend. After her 14-year-old Labrador Retriever mix died, Beth Reiter of Chicago was no exception. She wanted a companion to comfort her remaining dog, a nine-year-old “Lab/whatever mix,” Abbey. When Beth saw Penny, listed on Petfinder by Orphans of the Storm Animal Shelter in Riverwoods, IL, she was pretty sure Penny was that dog. Read Penny’s Happy Tail as originally written by her new mom. Beth took her then-boyfriend to the shelter with her to make sure she only came home with one dog. “I knew better than to trust myself,” she says. “When we met Penny, we were somewhat disappointed. 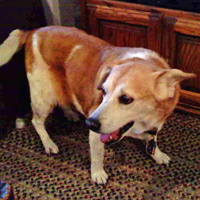 She seemed much older in person and had very bad arthritis and was overweight, causing mobility issues.” Penny didn’t seem like a good fit because Abbey was still quite active. The couple had brought Abbey with them to the shelter — it was to be a family decision — and when a shelter employee introduced them to a wiggly little 10-year-old Beagle named Emma, the choice seemed clear. Still, they just couldn’t stand to leave poor old Penny behind. Who would want her, after all, old and arthritic as she was? She needed a comfortable home in which to spend her golden years. The plan had been to get only one dog. “As we loaded the two new dogs into our car, I looked my boyfriend in the eye and told him, ‘You failed,'” Reiter says. Well, some failures are for the best. The couple has now been married over a year, and their happy family includes Abbey, Emma and Penny. With her forever family around her, Penny has probably been more active. She has lost weight and gets around better than she used to. It’s a new beginning for the old girl.